Fire protection is a determining factor in the construction or standardization of a building. The installation of active protection (sprinklers, extinguishers, etc.) is necessary but not sufficient. As a building professional, you must comply with building safety regulations. The primary purpose is to ensure that occupants can evacuate in the best possible conditions. Some catastrophes can also cause irremediable damage to a building, causing a complete shut-down of its activities. Passive protection works due to its mere presence, without human intervention or energy requirements, and requires no maintenance. Reaction to fire is a factor related to the material’s intrinsic properties. It includes all of a material’s characteristics in relation to its influence on the formation and spread of fire. 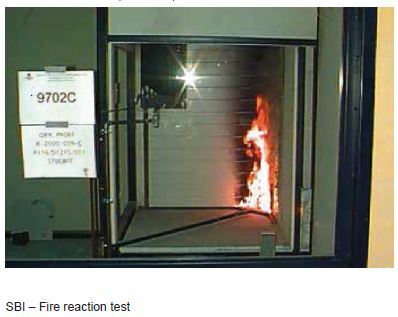 In accordance with amended Decree of 21 November 2002, the Euroclasses (the classification system for reaction of materials to fire) are determined using new testing methods that are harmonized on the European level. 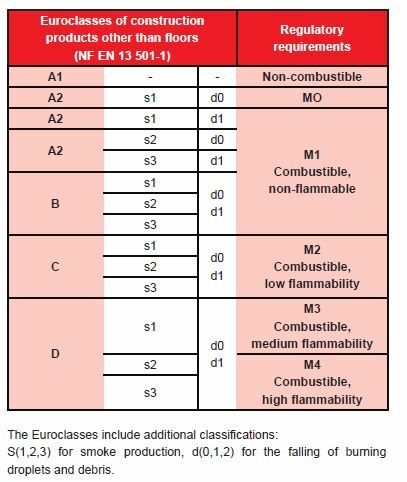 The adjacent table presents the equivalencies between the Euroclasses (A1 to D) and the old fire reaction classes (M0 to M4). Fire resisance, is a key parameter to take into consideration when designing a building. The methods for testing fire resistance and the resulting classifcations are defnied in the Decree of 22 March 2004 (which supersedes the Decree of 3 August 1999). Three criteria are used to assess the different fire resistance levels of buildings tested. For horizontal structural elements, this criterion is deemed satisfactory if the warping caused does not exceed 1/30th of the range or if the warping speed does not exceed 3mm/min per metre of range. For vertical structural elements, this criterion is satisfactory if the collapse speed does not exceed 3mm/min per metre of height or if the collapse does not exceed 1/100th of the height or if the collapse does not exceed 1/100th of the height. This criterion is met when the temperature of the surface not exposed to fire does not exceed an average of 140°C or 180°C at any given spot.